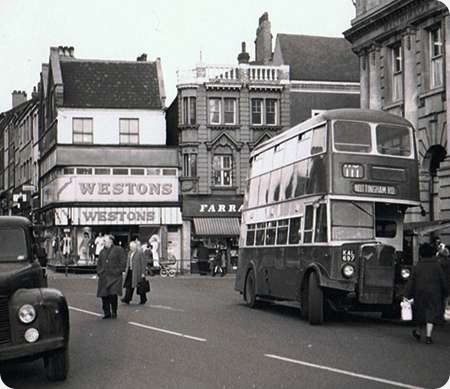 A busy scene here in the centre of Mansfield finds ex Ebor Bus Company KAL 697 amongst lorries and shopping laden pedestrians. The bus was new to Ebor in June 1949 has their fleet number 23, so was all but 19 years old at the time of the photograph. It looks in fine condition for its years. What magnificent specimens these were and quite unique in a THC fleet. Ebor originally ordered six of these in 1948/9 but found they had been a little too extravagant and sold one before delivery to neighbouring operator Naylors of South Normanton. At less than two years old when taken over by Mansfield District, these Regent IIIs fitted into the MDT fleet perfectly and gave them many years service whereas the Naylors example was taken over by Trent who disposed of it at twelve years old. This style of Brush body seemed far less prevalent than the ones of Bradford, Leeds, Derby etc, but perhaps more durable. Does anyone know if these were metal framed whilst the others were of composite construction? Of course, the longevity of these with Mansfield District lies in the fact that their standards of maintenance and presentation were always of the very highest order. Probably captured here in its last days of service, the 111 was a short service route that involved a reverse turn and was often served by vehicles about to be withdrawn. I’m a volunteer at the Bilsthorpe Heritage Museum. 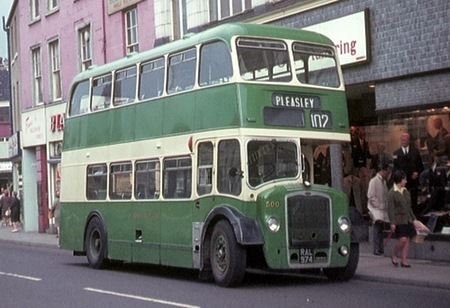 In connection with a display item, I need to establish the exact shade of green as applied to Mansfield District buses – not the later pale green version but the original darker shade – somewhat similar to Nottingham City buses? Can anyone help? With reference to the querry by Lawson Little regarding the ‘original Mansfield District green. Do you mean the colour that was used from the days of Balfour Beatty ownership pre-1948 until replaced by National Bus Company Leaf Green in the early 1970’s. If so I have an original sample of the colour that has recently been used to add the colour to our ‘Fleetmaster’ authentic paints for modellers. I began collecting samples and information in 1969 due to my interest in liveries and modelling buses. I can be contacted via the Dorset Model Buses website at: https://www.dorsetmodelbuses.co.uk and I would be pleased to help. 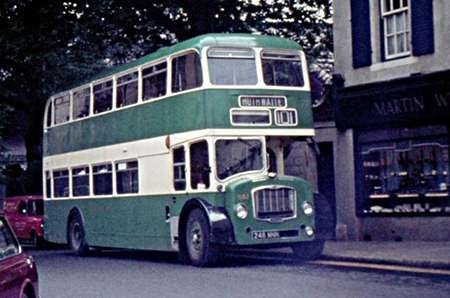 A smart looking Lodekka pictured in Mansfield in August 1968. Detail differences from the THC ‘norm’ were the livery with its larger area of cream and the destination layout. The Bristol BVW engine would no doubt ensure a refined journey on this bus. It’s good to see a shot of a Lodekka in something other than a standard Tilling red or green livery and with a different destination display. It almost gives a taste of what might have been if the Bristol/ECW make had been made available on the open market much earlier than it eventually was. There would have been no need then for the Loline and would we have seen Lodekkas in the liveries of such as Luton, Reading, Leigh, Oxford and Lancashire United and dare we say Aldershot & District. Interesting conjecture. At the time of the photograph, Mansfield District had a multiplicity of starting points for their services in the town, this was one of them, Queen Street. Since then, one bus station has come and gone and Queen Street now runs past the frontage of the new bus station which is a short distance ahead of where this Lodekka was standing. No need for the Loline? Perhaps, but, good as the Lodekka was, the Loline was a better bus, and I’ve driven both. The link below will take you to some magnificent photos of Mansfield District buses, including one of the slightly later FLF/6G’s. Apart from livery, they look so much nicer when shorn of adverts. http://midlandgeneralomnibus. Is it really on the pavement- because the road is already broken up? Clearly cared for- look at the undented dome. Does the camera lie or was that really the green? But seriously, did these go to West Riding, post Wulfrunian or were those Gardners? Whilst it shouldn’t have been parked there I don’t think it’s on the pavement. It’ll be well close inasmuch as the roadway at the rear was tight. It’s not ‘on stand’. There was a small café just behind the photographer that survived on trade from the busmen. The 101 stand was about 100yds further on. As for the condition of the vehicle, quite normal for this operator. MDT prided themselves during the 60’s / very early 70’s in not sending any dirty or damaged vehicles out on service. That policy was sadly abandoned once ‘leaf green’ appeared in the stores! Chris H: many thanks for the link to the gallery. The Sunbeam Sikh is nothing short of magnificent, and the rake of the steering column brings us back to Lodekkas and Lolines. Nice to see MDT in the spotlight. I recall my first sighting of an MDT bus when I was about 6 or 7 years old, on a walk with my grandma somewhere in the Moor Bridge area of Bulwell. I identified what I thought was an MGO AEC (same style bodywork, same destination display) but it was GREEN where I was expecting MGO blue. I remember managing to read the "Mansfield District" fleet name and was intrigued by this first (to me) manifestation of a group corporate style. Obviously I later came to understand this local grouping and always treasured the rare sightings of MDT vehicles. I think the photo captures the shade of green rather well, it was lighter than Tilling green, more a sort of apple green but its rarity in the public domain is all the more special. Local acquisitions meant that the MDT fleet contained some rarities that sister companies like MGO did not possess, but of course these feature in my my long list of pictures I should have taken but didn’t. The transfers to West Riding to replace Wulfrunians were rear-entrance LDs/FSs as far as I know, but this is one of the eras I need to revisit when I can get my time-machine working properly. I suspect I am not the only one with this problem? I always liked the Bristol Lodekka with the original long grille-thought it gave the bus a more purposeful appearance. A chance visit to Mansfield in August 1968 found this example which appeared to be in excellent condition for its age. As Chris H rightly says, some of these vehicles were transferred to West Riding as Wulfrunian replacements and were apparently considered to be amongst the better ones so transferred, not surprising considering MDT/MGO’s excellent maintenance standards. Also unusual is that this vehicle carries no adverts of any sort and I think looks much better for it! I too much preferred the long radiator and the traditional Bristol shape of it to the later version, which always gave me the annoying impression of having been in a lower end collision and being amateurishly repaired by "chopping off the damaged bit and putting in a new straight lower shape." I also have an aversion, on all buses, to front square number plates with two rows of three characters – the normal long number plate with all characters in one line looks far tidier at the front and, in many cases, even at the back also. This vehicle’s sister, RAL 976, did some sightseeing work here in Halifax, Nova Scotia in the early seventies, alongside an ex London RT, and at the time made a fine sight in its green livery, I think it had been with West Riding before export to Canada. It moved on years ago, to destination unknown, and I suppose it presumably could still exist, but more than likely has succumbed to the scrapman’s hammer by now. I am not at all surprised to observe the superb condition which the Mansfield Lodekka demonstrates! Ignoring any design preferences of individual enthusiasts, I struggle to define any ECW bodied vehicle as being "worn". Most would seem to be capable of completing a 40 year life cycle. Undoubtedly the finest exponents of bus building which ever existed, the quality and innovation of which was, in my humble opinion, totally unmatched. It is to be greatly regretted that this wonderful company was allowed to disintegrate! ECW bodies never failed to exude total quality, their obsolescence being defined simply in terms of "fashion". I have no "axe to grind", and enjoy, as an enthusiast, other products than those from Lowestoft, but wonder if former professionals from within the industry are able to destroy this "illusion" of mine? Although I cannot fault the general impression of these vehicles, I was never that keen on the ‘hump’ below the driver’s cab, giving to me, at least, the impression that it had had a front-end shunt and was yet to be repaired! AS Chris B says, the absence of adverts greatly enhances its looks. Were that they’d all been like this! The Photo of RAL 974 is not standing on the 102 Rank and as a driver for MDT I am suggesting that the vehicle will be driven round to Queen Street to duplicate the service 102 bus to Pleasley hence the via blind is left empty. I used to be a driver for Mansfield District from 1968 and my father did fifty years for Mansfield it takes me back. I still am in the bus industry I’m a supervisor for West Coast Motors on the west coast of Scotland it was a good time at MDT. I was at Midland Travel as well. "ECW bodies never failed to exude total quality…"
Not quite, John. The B51 coach body was an absolute aesthetic and structural abomination, utilising large areas of unsupported glass fibre that simply collapsed in service. All the fittings were flimsy and the luggage boots leaked rainwater and road dirt. It was produced under the directives of the Stokes ‘led’ Leyland empire and so bad was it that it must have hastened the ultimate demise of ECW. Yes, but I think that it’s a given that any Stokes era history is a period not to savour and that John was thinking of "real" ECW in the same way that I differentiate between Leyland and British Leyland. You are absolutely right that the B51 was an abomination but its failings revolve around British Leyland trying to slap a body literally designed around a rear engined vehicle (the Bristol RELH) onto mid-engined designs without any thought to structural integrity. [Even the earlier, purer, versions on Leopards for SELNEC/GMT suffered similar problems but they were too embarrassed to mention it at the time.] Sadly, at the same time as the B51, Willowbrook offered its own abomination, the 003. Duple were not much better either and, as we all know, Plaxton eventually joined the slide into mediocrity or worse. I seem to recall that United took some Leopards with the plasticky B51 bodies for National Express work. The chassis did not have sufficient fixings to cater for the enormous boots required, worked themselves loose and at least one fell off, strewing luggage all over the motorway. None at all Chris. It was an unsupported boot. Originally the body was (semi) integral with the RE frame – and thus very rigid and strong. Here began its troubles. I wonder who dominated here, David O, engineers or accountants! No brainer Chris. Got to be accountants. Whenever there’s a choice between experts/professionals and accountants the outcome is chaos – just have a closer look at the accountants. You don’t have to look too far to see who is at fault. I’ve finally dug out my photo of RAL 974 taken in Newark in 1961, at which time it was wearing advertisements. 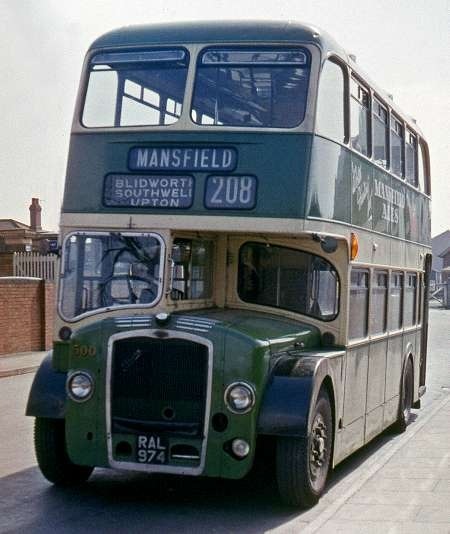 Thanks Roger, for that wonderful photo, Mansfield District had several services between Mansfield and Newark but the principal ones were the 208/209 which combined to provide an hourly headway (even on Sundays) between the two towns by slightly different routes. On Saturdays the frequency was doubled up to half hourly for most of the day. Although Newark had a bus station, for some reason all the MDT services at that time terminated at Northgate railway station which can be seen in the background. They did move into the bus station in later years. 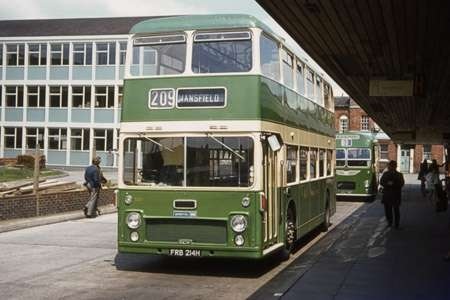 Here is a slightly more modern Mansfield District vehicle – but still in the traditional livery – a Bristol VRT/ECW Series 1, seen in Newark Bus Station about to return to Nottingham via the 209 route in 1971. Slip of the fingers there John? It says "Mansfield" on the blind! Nottingham was the 215. The fundamental difference between the 208 (via Blidworth, Southwell, Upton – as shown on the Lodekka) and the 209 was that the latter ran via Rolleston and Fiskerton between Newark and Southwell. I fancy it was meant to substitute for the train following closure of the Rolleston Junction – Southwell branch line.